I am capable of spiraling down, down, down … becoming a sad sack who can’t see anything to be grateful for in life. Seriously, just ask my husband! I’ve got more ‘stories’ than a grade 5 creative writing class. Even though I know better, I can really turn it on when it suits my cause. 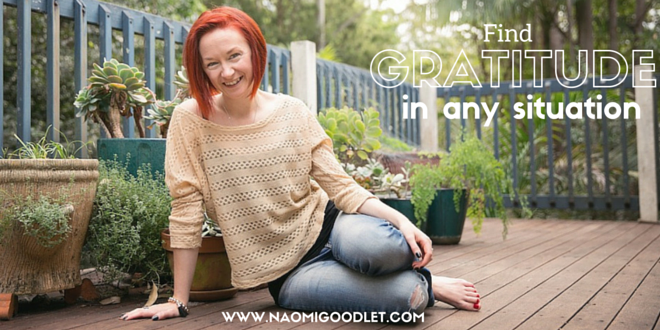 So the first thing that was pivotal for me was to make that shift from lack to gratitude. I know that many of you will be old hands at this or perhaps even reckon you could tell me a thing or two about gratitude (you probably can) but seriously this is a concept that I understood and resonated with for a long time but I was never able to apply it consistently. When doing gratitude work as a formal process, it is easy, it feels great BUT often it does not stick. We slip back into our old patterning and only come back to gratitude when we remember it from time to time. I was able to make a change when I tried a little experiment – observing and documenting all of my complaints (and there were A LOT of them). Sometimes I would complain all day long and then see a client and tell them off for complaining! When I realized the enormity and frequency of my complaints, I committed to gratitude action immediately and I haven’t looked back. (sometimes we need to see the awful truth before we can do something about it). Instead of focusing on what I “have to do”, which only left me feeling defeated, stressed and powerless, I changed my focus to what I “get to do”. This made me realise how grateful I am to be able to spend quality time with my daughter and made me think of my husband, having to work long hours, missing out on this stuff. It helped me to realize that it’s worth it, even when it’s hard. … Even cleaning (which I dislike and often complain about). I turn “this is dirty and need cleaning” to “I get to live in a clean space as the result of my efforts”. It just feels lighter, right? My aim now is to let go of ‘chores’ and just enjoy everything I get to do with gratitude and peace. This post was originally published in 2014 and I've recently revised it!